Curiously, I seem to be getting much more traffic now I’m hosting this blog on WordPress.com. 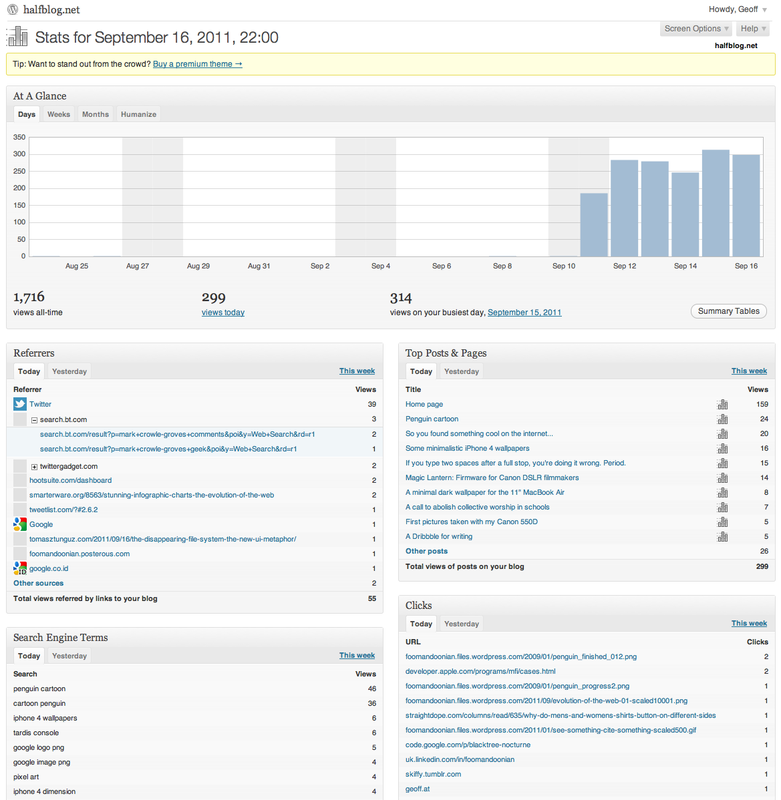 I used to get 100-200 visits per day on Posterous, but now I’m seeing 200-300. It could be a simple reporting difference, but I know from personal experience that Posterous could be slow to the point where the page never finished loading. I wonder if it regularly prevented the Google Analytics script at the end of the page from getting loaded? Not being able to use Google Analytics on this blog any more is actually the biggest drawback of switching to WordPress.com. The stats features they offer are actually really good, offering hourly updates, referrer info, incoming search terms, top performing content lists and most clicked links. Plus there’s a handy sparkline that appears in the bar at the top when I’m logged in. But it would have been nice to keep a record of the stats in the same place as all my other sites. Even worse, it doesn’t look like there’s an easy way to export my stats now. This entry was posted in WordPress and tagged Google, Posterous, stats by Geoff. Bookmark the permalink.